Our natural skin care ecourse has now been transformed into bigger and better; quick and easy DIY step-by-baby-step eGuide that teaches you absolutely everything you need to know about how to start making your own rejuvenating organic skincare treatments. With the "How to Start Your Own Natural Skin Care Routine" eGuide, it will be like having me right by your side acting as your very own personal skin care consultant to help you begin your natural skin care routine. It's all about effective rejuvenation skin care the natural way. So here's the special scoop on this new release. . . Since it was the visitors to this website and the subscribers to the Skinsational News monthly newsletter (... yes, that would be YOU!) who kept sending me emails to give me a much needed kick in the kabunzies to transform the Natural Skin Care eCourse into a much more comprehensive eGuide, I want like to offer you (and only you) an extra special price to celebrate this new release. when placing your order and instead of paying the list price of $7.95. . .
You will get half of the list price! And as a little extra special bonus for this "Just for You" discount, I've also included the Natural Skin Care Recipe Card "Starter Collection" as a big, hearty THANK YOU for giving me the push to get this project done. twelve 4X6 downloadable Recipe Cards! The recipe cards are really convenient to bring with you while you mix-up your rejuvenating organic skincare recipes and they also make a really inexpensive, thoughtful and lovely gift too. You are going to look absolutely Naturally Skinsational when you start making your own skin care the natural way. At 54 years (young), I have to say that by including homemade skin care treatments in my natural skin care routine for the past (*GULP*) decade or so, it has made a world of difference for not only the health of my skin but in effectively treating the whole host of aging skin conditions that try to sneak up on you the older you get! I do so love anti-aging skin care the natural way. 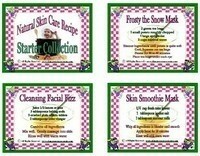 Homemade organic skincare facial recipes and homemade natural skin remedies ROCK! And the beauty of it all is, that all you need to do is reach your kitchen cupboards, whip up a quick and easy anti-aging skin care recipe a few times a week and, VIOLA! You have given your skin all the powerful benefits of natural anti-aging ingredients that work to restore the health of your skin and rejuvenate it to your skin's former younger more subtle, healthier appearance. Not bad for the cheapest, easiest, quickest and potent anti-aging skin care treatments that you can use for effectively revitalizing and treating all the symptoms of aging skin. Wrinkles begone! Age spots fade away! Sagging skin firms, and skin tone dramatically improves for radiantly and vibrant beautifully looking skin once again. It's rejuvenating skin care the natural way. Start your own natural skin care routine. Prepare your own organic skincare treatments and natural skin remedies that effectively treat aging skin concerns. Homemade skin treatments provide your skin with an astonishing array of rejuvenating benefits for anti-aging skin care the natural way. copy of your receipt and I will issue a full refund. If you have any questions about how to rejuvenate skin care the natural way, feel free to post them on the skin care forum and I will answer them as quicly as possible. 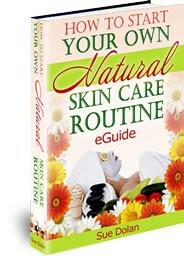 My most hearty thanks to you all in celebrating the release of the "How to Start Your Own Natural Skin Care" eGuide! To a younger, healthier and more a vibrant Naturally Skinsational look! And My Most Hearty Thanks to you All. P.S. Please note: This is an eGuide (It's not available in paperback. . . yet!) which means that after your purchase you will be provided a download link and directed to save the eGuide to your computer to read or print at your leisure.